A late night potty break each night, a Busy Bone, a departure bath, nail clipping and a nature walk, the perfect package for puppies under 6 months. 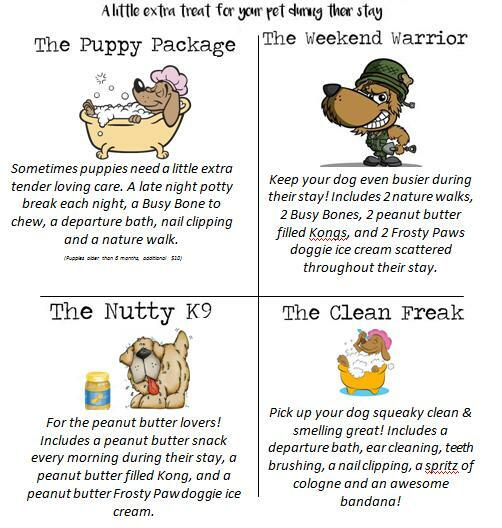 Treat your dog during their stay! 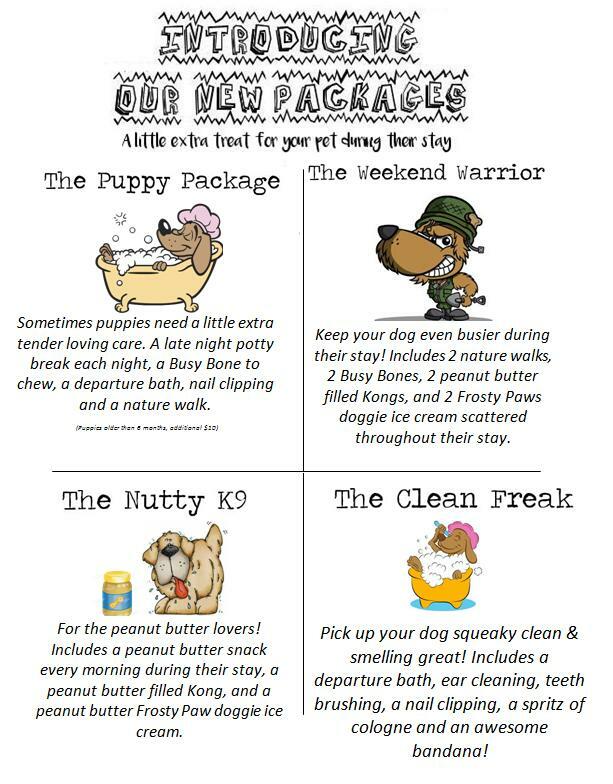 Includes 2 nature walks, 2 Busy Bones, 2 peanut butter filled Kongs, and 2 Frosty Paws doggie ice cream throughout their stay. Keep your dog busy even if it’s for a shorter stay. Includes a nature walk, 2 peanut butter kong’s and a busy bone. For the peanut butter lovers! Includes a peanut butter snack every morning, a peanut butter filled Kong, and a peanut butter Frosty Paw doggie ice cream. Pick up your dog squeaky clean & smelling great! Includes a departure bath, ear cleaning, teeth brushing and nail clipping, pet cologne and an awesome bandana! For senior dogs, this package includes 2 slow paced calm senior strolls,2 soft treats & administering of medications with pill pocket, cheese etc. All packages are 1 flat fee. Give your pup some 1 on 1 attention and exercise while on their doggie vacation, a nice stroll through the woods on a secure leash and collar. For our seniors who would like a nice, slow, quiet, calm stroll down Nolan’s Way, through the grass to sniff all the wonderful smells! Paired with a bath or not, keep your pet safe from this years flea and tick’s. One application lasts for 30 days. Is your dog a peanut butter lover? They’re sure to be happy with a kong stuffed to the max with peanut butter. A nice pigs ear for your dog to chew on. Yummy! Keep your dog occupied while they take their rest inside. A busy bone is sure to keep them busy while they relax! Treat your pet to a nice cold ice cream treat during their stay! They’ll be sure to love it.